Released in February of this year under the watchful eye of Camomille Netlabel, Montréal I/II is a musical tribute to the city. 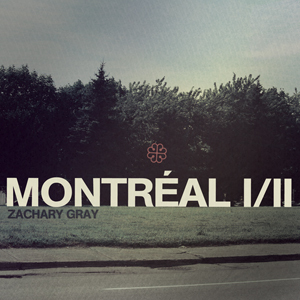 In fact Zachary Gray‘s music is a breathing city itself. It flows from fast tempo beats and repeating electronic sounds reminiscent of the chaotic commotion to the slow harmonic and relaxing melodies taking us on the journey through the streets of the night. And although some of the songs might take you back to the early days of Moby, Gray’s album is filled with original cuts ready to become part of your playlist. In the words of the netlabel: “Montréal I/II is an eclectic mixture of influences; often polarized between the warm & festive tones of summer to the deeper and more solitary moments of winter”. Its true, the album is a fusion of different styles, taking a carefully planned and executed journey from ambient to drum ‘n’ bass to electronic and beyond. It features heavy use of eeire vocal snippets and samples from the media intertwining them with the dreamlike melodies. Although the tracks gently flow from one to another creating a feeling of a movie soundtrack there are certainly those that can easily stand the ground all by themselves. One of such tracks include Childhood Obesity. Probably one of the most heavy influenced by media samples, the track beams with soft electronic beats and voice snippets taken from a TV programme highlighting the issue (you can watch the video below). The album does come with a few shortcomings as seen in the slightly awkward mixing of some of the tracks. Overall, however, Montréal I/II is more than just a treat and a need to have download for all the genre fan.